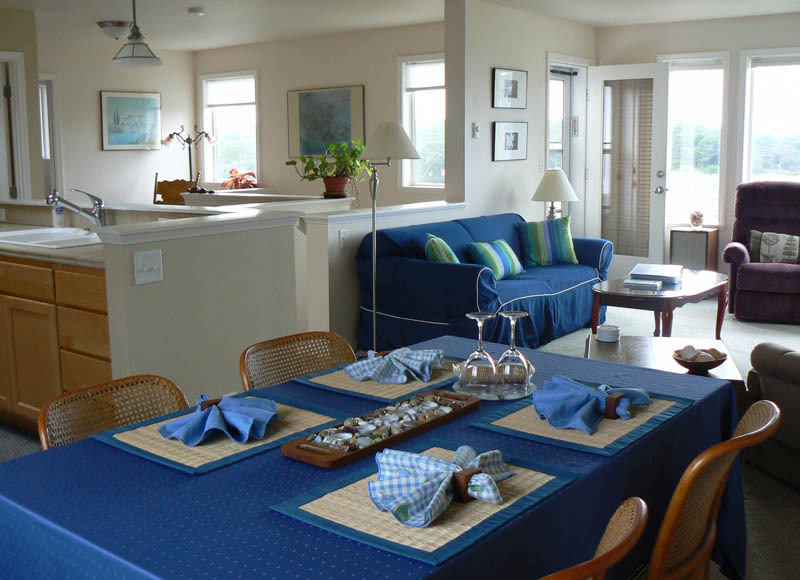 The Seaview Townhouse at Coquille Point Condominiums offers 2-bedroom accommodations, comfortably furnished to provide for all the needs of your vacation. At 1,450 square feet, the townhouse is large enough to spread out and make you and your family or friends feel at home. follow the seasonal whale and bird migrations or view nesting sites on the seastacks from the comfort of your chair. The Great Room amenities, in addition to the ocean view, include high-definition satellite TV with sports, movie and music packages, DVD player, and stereo CD player. There is an activity alcove for games or laptop use and a reading alcove with rocking chair. A pull-put queen sofa and a small library of VCR movies, DVDs, CDs, books and magazines as well as WiFi Internet complements your stay. Adjacent to the living area is a dining table, as well as TV trays. 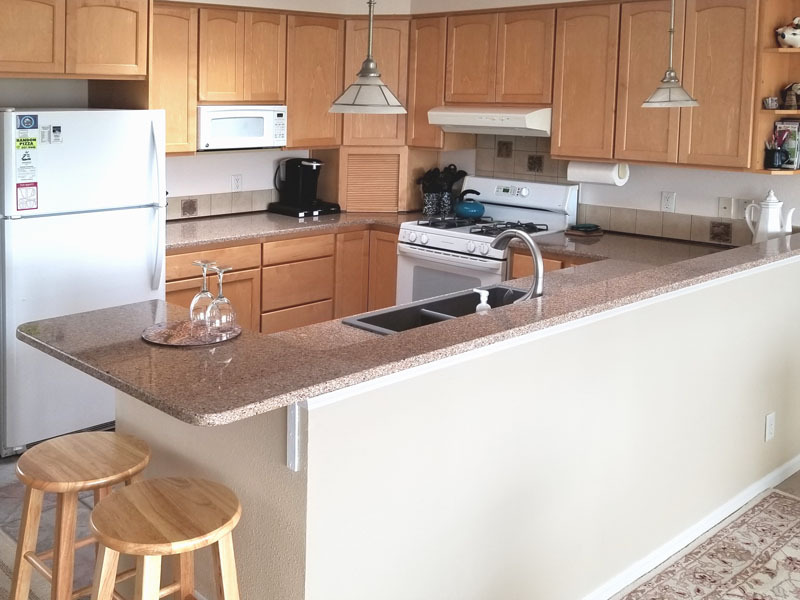 The fully furnished kitchen features a skylight, tile countertops and floors and a complete suite of appliances: 4-burner gas range and large self-cleaning oven, refrigerator with icemaker, microwave, dishwasher and disposal. It is furnished with kitchen utnesils, cookware, bakeware, chef's knives, silverware, plates, cups and glassware. Small applicances include coffee maker, coffee grinder, blender, toaster, and mixer. 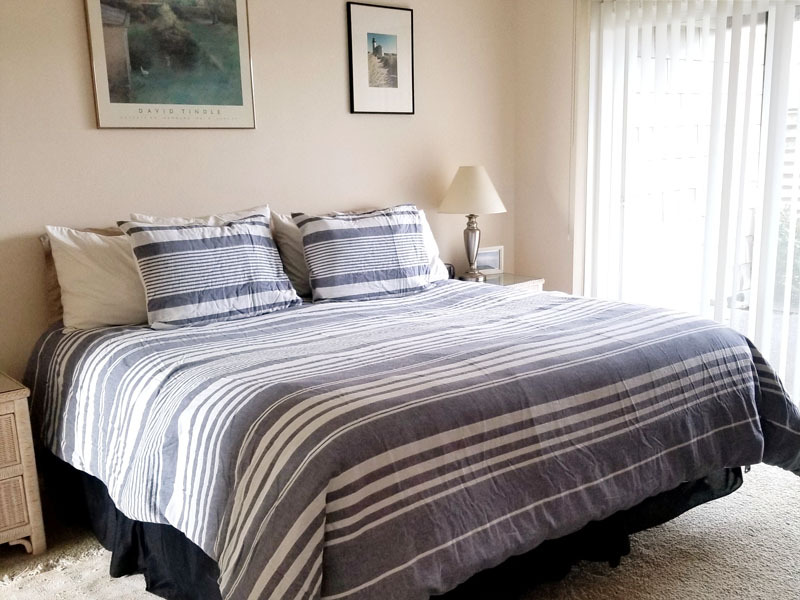 Downstairs, the townhouse has a fully furnished laundry room and an attached two-car garage with a washtub handy for beach clean-up or preparing a catch of local crab or salmon. The roll-out gas BBQ, several patio and beach chairs, and beach toys are also in the garage. Outside, enjoy the common picnic area or the panoramic view from any of the patios, or take a stroll through our new dry-creek garden where you can enter whenever you'd like to relax and just linger for a while. View the ocean horizon and the tops of the offshore sea stacks from a bench in the garden, or walk the paths to the ocean wildlife viewing area. Continue along the well maintained paths to the stairs at either end of the park and scour the beach for agates or watch the surf break on the rocks. The ground floor master bedroom has a king-size bed (which can be made up as two extra-long twin beds, on request), and its own patio. 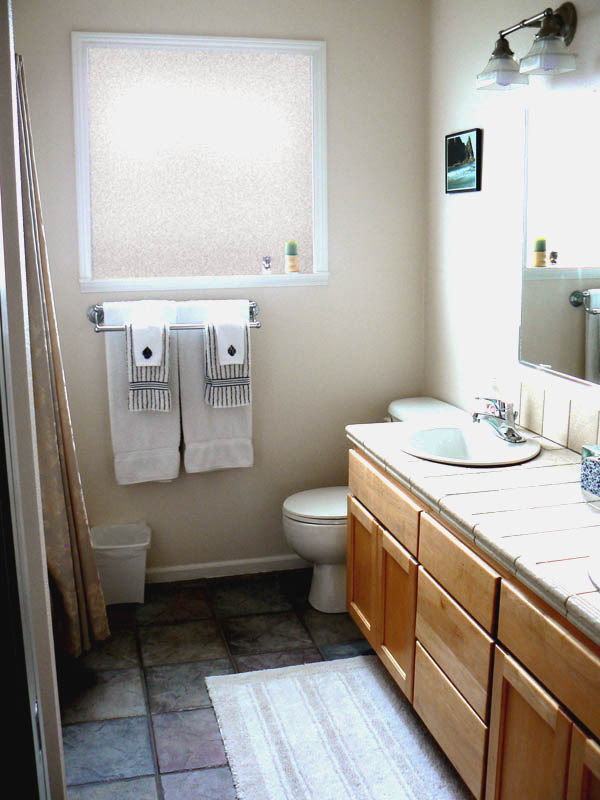 The bedroom's accompanying walk-though wardrobe and double-sink bath with shower/tub complete the suite. Upstairs, the second bedroom also offers a king bed (or two extra-long twin beds on request) and an adjoining bath area with vanity sink, shower-tub and WC. Both bedrooms have a high-definition satellite TV and the upstairs bedroom has a video cassette player. A fold-up crib, high chair and 2 sets of child-proof stair gates are stored downstairs. 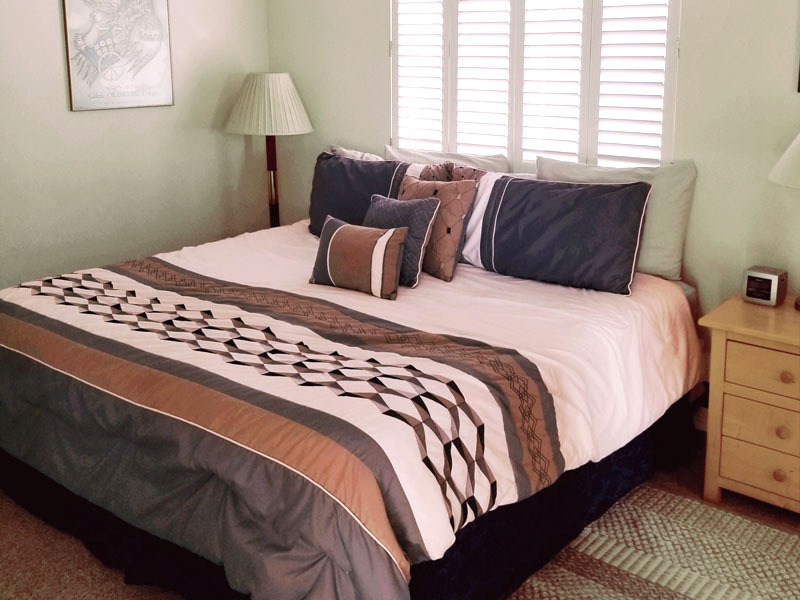 Ceramic tile floors in the entry, baths, kitchen and high traffic areas, wall-to-wall carpeting in the living and sleeping areas, tile countertops in the baths and kitchen, and ocean views from the Great Room windows ensure guests easy and comfortable living. 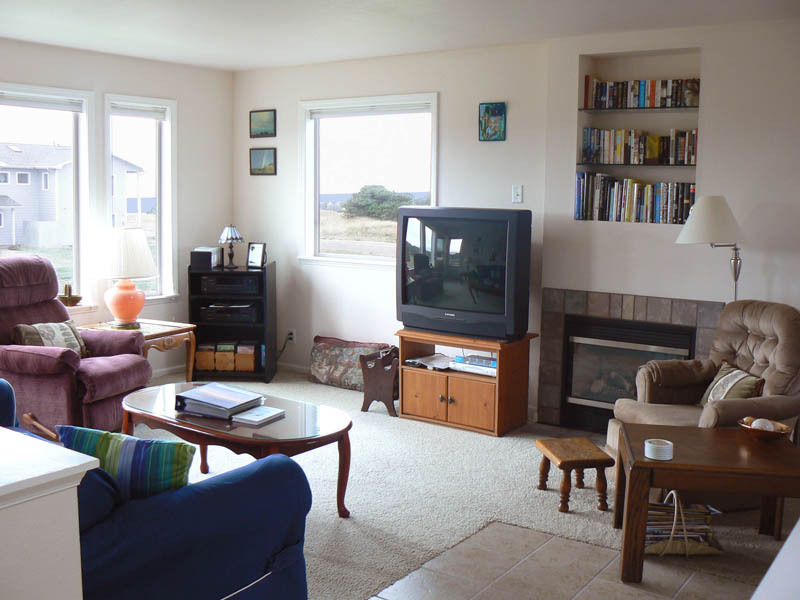 This townhome is designed to cater to the needs of the Pacific Coast vacationer, fisher, golfer, boater, birder, hiker or nature lover while staying on the cliffs overlooking the Pacific Ocean in Bandon.